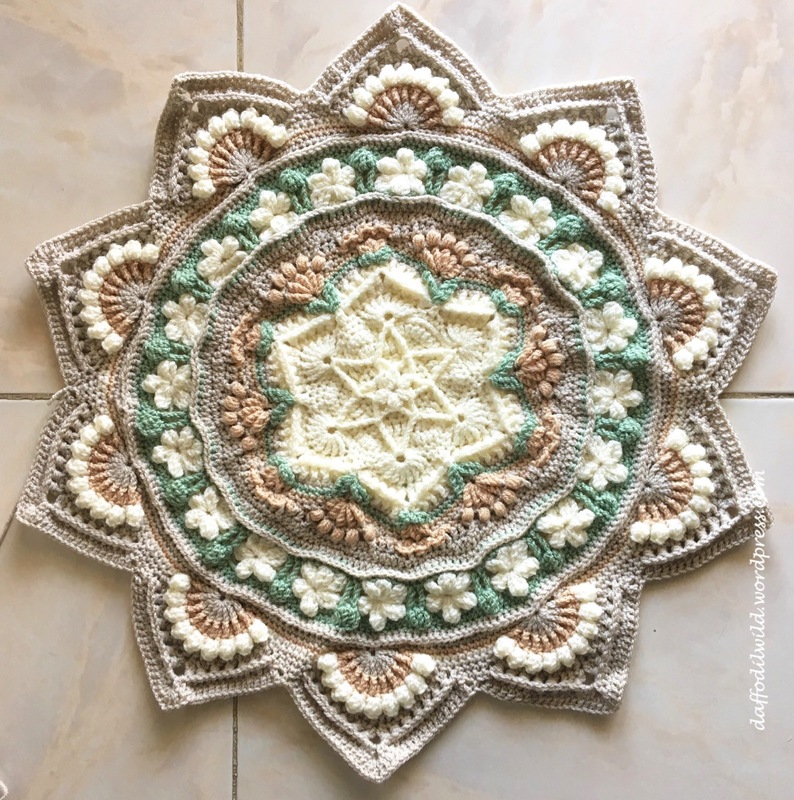 This entry was posted in Crochet, how to, mandalas and tagged Lost Garden, mandalas, pattern by Helen Shrimpton, snowdrops. Bookmark the permalink. Helen Shrimpton’s patterns are an inspiration. These colours really are calming. 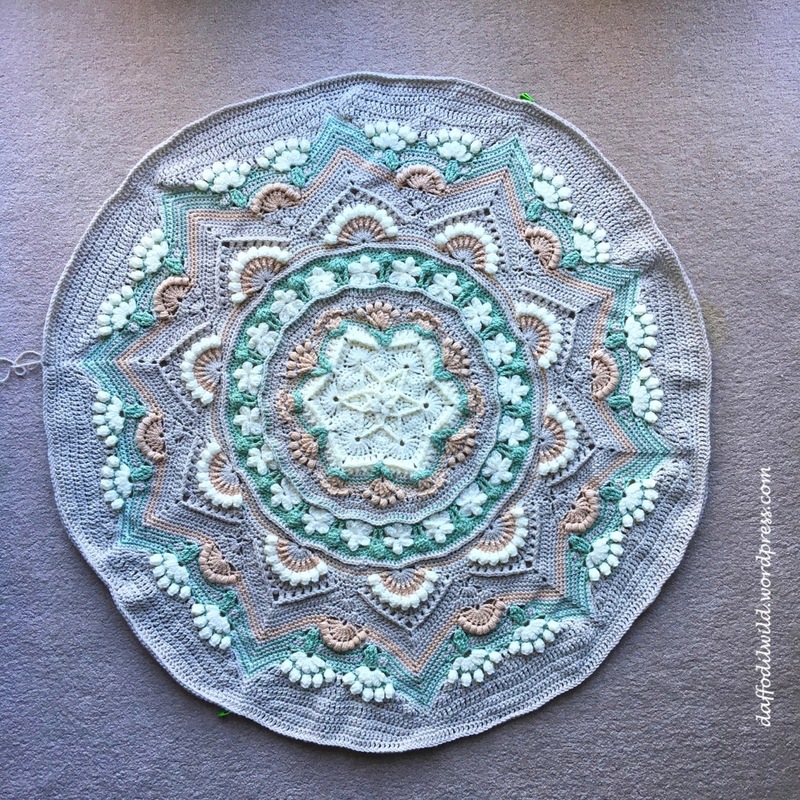 I would be love to see this in sea blues and turquoises… one day I might make one! 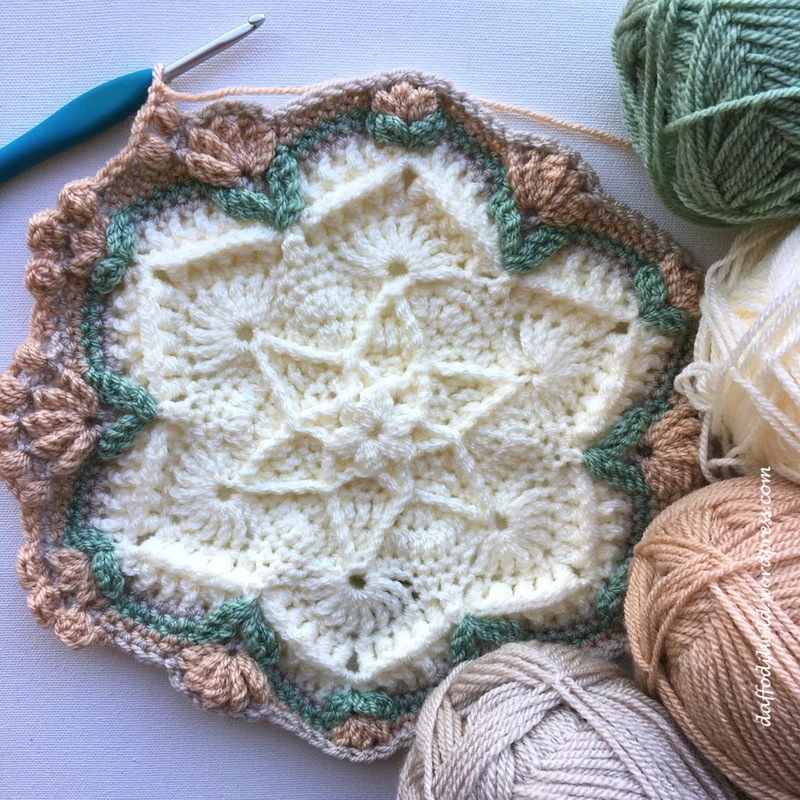 The pattern is easy to follow and relaxing to make – I can highly recommend it – and yes it would look lovely in blues. Helen Shrimpton is a genius! I like the Victorian feel to this! It makes me happy that it has a Victorian vibe. None of those are colours I would think to choose either – but, as I’ve said before, you are the master of colour work and the whole thing is just beautiful. You’ve made me think it might be quite nice to have a gentle blanket to snuggle under sometimes 🙂 So many ideas, so little time!! You are so kind Pauline – I get inspired by the colour preferences of others and find it fun to create something I can like with them. I do love snuggling under blankets on the sofa – must crochet one for myself sometime!! Ooh,lovely pattern and I love your colours. 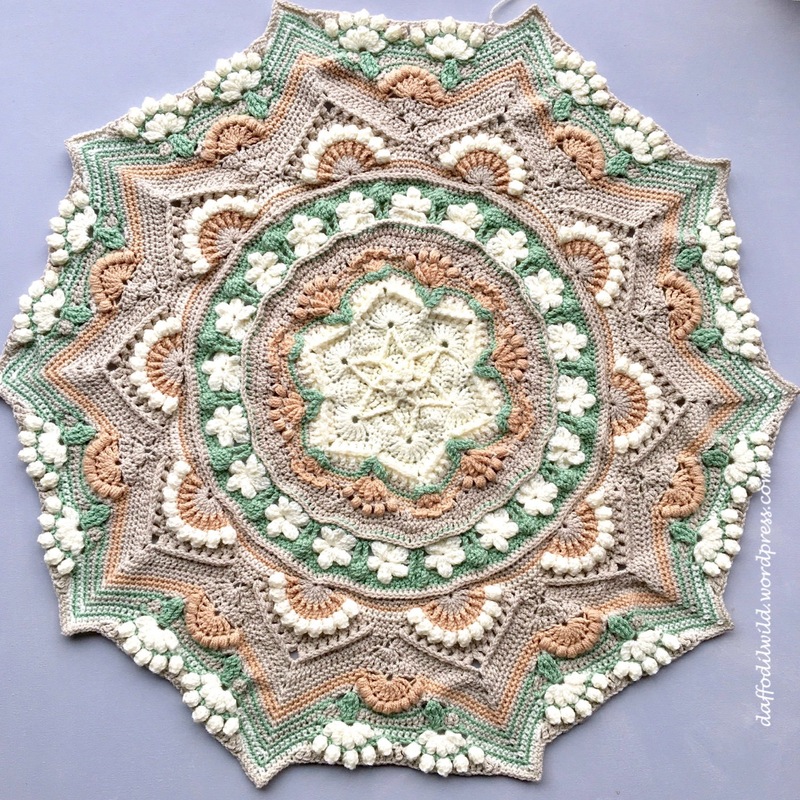 If I hadn’t already started another Eastern Jewels blanket I might be tempted. 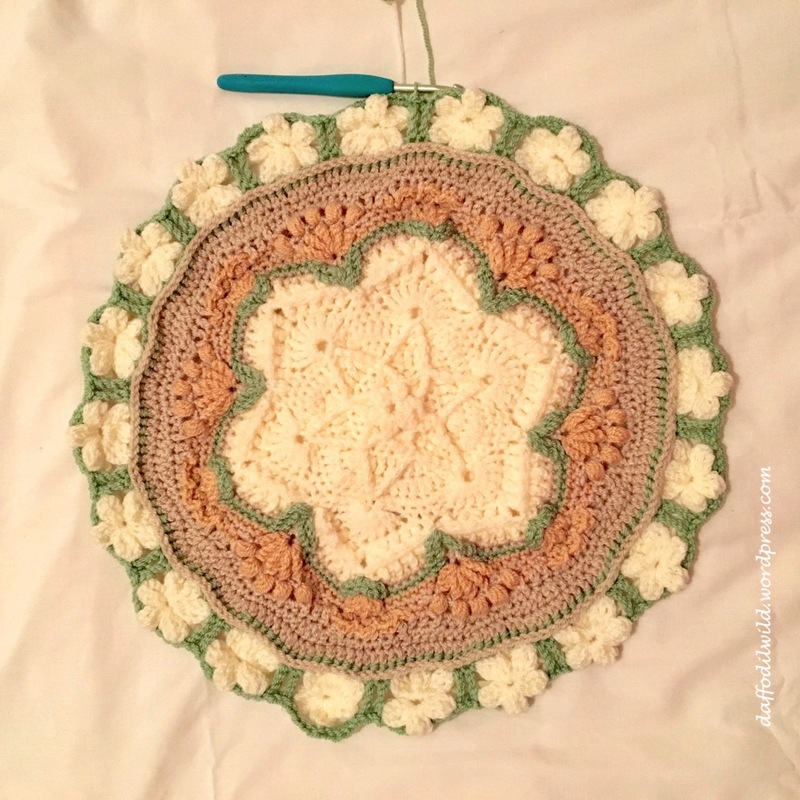 However, I might wait until later in the year because, as it’s all in one piece, I could overheat beneath it on a warm night and be found in the morning, barely conscious, covered in cats and dogs, crochet hook gripped firmly in hand. What a lot of work! I am sure it will look very elegant when it is finished. Thank you. This pattern is so much easier to work than the Jen Tyler patterns – it is like taking a holiday! Such a serene color scheme, very beautiful! Beautiful colours and such an intricate pattern. Looks like one of your doodles. I was thinking the same – one project inspires another and so it goes …. It is magical – I think you would love it Laurie. I know I would! I can tell just by looking at the pictures. Pretty springlike colour scheme, but I’d also love to see it in the colours of high summer! Ooo yes! That would look fab! Oh gosh – I might have to do another one now – sighs and looks at mound of works in progress!